Indiana University’s Summer Research Experience for Undergraduates in Animal Behavior gives 10 students the chance to participate in both field and lab work over a ten-week period. The program, founded in 1990, is one of the premier animal behavior internship opportunities and is funded by the National Science Foundation. Interns accepted into the program cover topics such as behavioral development, ecology, genetics and evolution. The key driver is how and why animals behave the way they do. Students must be U.S. citizens or permanent residents, and must be enrolled as an undergraduate during the internship. Because of the nature of the program, interns cannot take outside classes or hold down a job during the 10-week period. All students are compensated with a stipend, a private dorm room on campus, all meals and travel expenses. Applications are due in February. The program generally runs between May and July. The Darley Flying Start program offers students the opportunity to travel the world while working with Thoroughbreds in all aspects of the racing industry. The two-year program offers twelve students the chance work at top farms and racetracks in England, Ireland, Dubai, Australia and Kentucky. Applicants must submit a resume, college transcripts, three references, a cover letter and a 90-second video answering three pre-selected questions. Interviews are then set before candidates are selected. Students receive a stipend, housing, transportation and health insurance. Interested in becoming a wildlife rehabilitator? The National Wildlife Rehabilitators Association in Illinois offers a wildlife rehabilitation internship opportunity at its wildlife hospital. Students have the chance to help with exams, critical care, feeding, orphans, releases, fundraising and more. These intensive internships average a 60-hour work week, but interns receive a $700 stipend plus free housing and utilities. Do you want to work with marine animals? Sea Life Park Hawaii offers several internships opportunities including: marine mammal care and training, reef and sea turtle care, and veterinary technician services. 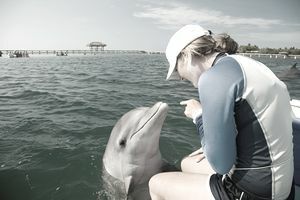 Interns may work with dolphins, sea lions, seals, penguins, sea turtles, stingrays, sharks and reef fish. Internships are unpaid but lunches are provided. There are spots available for the spring, summer and fall periods. Candidates must be a least 18 years of age, be enrolled in or graduated from a college or university. Skills required include swimming and public speaking, and applicants must be physically fit. The commitment is 40 hours per week. In order to be accepted, applicants must submit two letters of recommendation, transcripts, a statement of interest and a resume. The University of Florida’s Small Animal Hospital offers a 12-month veterinary technician internship for recent graduates (or experienced techs) interested in anesthesia or emergency care. There is also a rotating internship, which allows interns to rotate through a series of specialties before choosing other elective services to study as well. The program accepts one intern per program for a total of three interns. Compensation includes a salary of $31,000, health and dental insurance, and ten days of paid vacation. Applications are due in March and the internship begins in June. Applicants must be U.S. citizens and must be graduates of an American Veterinarian Medical Association (AVMA)-accredited school. The Kellogg Bird Sanctuary (in Michigan) offers an avian care internship program to college upperclassmen and recent graduates with a degree in biology, zoology, pre-vet, or a related area. Summer internships run for 12 weeks, while spring and fall internships run for 22 weeks. Interns provide daily care for captive birds, glove train raptors, present educational programs, and complete research projects. Compensation includes housing, a stipend of $2,500, free housing at KBS, free meals, transportation and college credit. Applicants must include copies of their resume, college transcripts and a list of all college courses relevant to the internship. A statement of interest and contact information for at least one reference must also be included. Deadlines vary based on the internship date. The Kentucky Reptile Zoo internship program is a 3-month program that gives upperclassmen college students or recent graduates the opportunity to work with a wide variety of reptiles. Students learn handling techniques, give educational speeches and conduct research. Interns are not permitted to handle any venomous species. College students may receive academic credit and a small weekly stipend is offered. Graduates of this program have had a 95% success rate in finding professional employment in the field. Internships are offered for all seasons — the spring between March and May, the summer between June and August, the fall between September and November, and the winter between December and February. The internship comes with housing and a $55 per week stipend. Students must be majoring in biological or natural sciences, have a valid driver's license and must be willing to work weekends. The Southwest National Primate Research Center in Texas offers undergraduate and graduate student internships for 8 weeks each summer (and on a limited basis year round). The facility boasts the largest captive baboon population plus a variety of other species such as chimpanzees, macaques, marmosets, and tamarins. Summer internship applications are due in January and up to six interns are selected. Students must provide two references, college transcripts, a resume and a statement of interest. They must also choose a mentor from the staff list — each of whom has agreed to serve as mentors. Interns receive an hourly wage based on experience plus up to $1,000 per student to use toward supplies or research expenses. Surfing Goat Dairy in Maui, Hawaii, offers internship opportunities at its goat dairy facility. Interns can assist with cheese making, milking, husbandry, catering, deliveries, marketing, tours and sales. Compensation includes furnished housing, internet access, most meals, use of a shared car, an employee discount on purchases and a stipend of about $200 per week. The Miner Agricultural Research Institute in New York offers a Summer Experience in Farm Management for undergraduates that runs for 12 weeks. The program introduces students to the business aspect behind the modern farm, so they should be prepared to work the long hours many farmers do. Interns are involved with herd management, milking, livestock shows and research projects with a herd of more than 300 Holstein cows. Compensation is $3,000 less a $300 fee for housing and meals — breakfast and lunch are included on weekdays. Applications are due in February and internships run from May to August. A one-year dairy internship is also available for college graduates. Miner also offers equine internships with its Morgan herd. In order to apply, students are required to complete the application and submit college transcripts, two letters of recommendation and a letter outlining their career goals.